I get pretty tired of seeing conservative types across the internet badmouthing “liberals.” Not that I would ever tell them not to do it — that wouldn’t be very liberal of me. The real problem here is that the Democratic Party of the United States has co-opted the term liberal to mean, well, basically whatever they want. Anything but what it actually means, that is. Here are some definitions from around the web (I’m only including those that relate to politics). favorable to progress or reform, as in political or religious affairs. of, pertaining to, based on, or advocating liberalism, especially the freedom of the individual and governmental guarantees of individual rights and liberties. favorable to or in accord with concepts of maximum individual freedom possible, especially as guaranteed by law and secured by governmental protection of civil liberties. of or relating to representational forms of government rather than aristocracies and monarchies. Not bound by orthodox tenets or established forms in political or religious philosophy; independent in opinion; not conservative; friendly to great freedom in the constitution or administration of government; having tendency toward democratic or republican, as distinguished from monarchical or aristocratic, forms; as, liberal thinkers; liberal Christians; the Liberal party. One who favors greater freedom in political or religious matters; an opponent of the established systems; a reformer; in English politics, a member of the Liberal party, so called. Cf. Whig. Not limited to or by established, traditional, orthodox, or authoritarian attitudes, views, or dogmas; free from bigotry. Favoring proposals for reform, open to new ideas for progress, and tolerant of the ideas and behavior of others; broad-minded. None of those definitions says “freedom to kill others,” or “freedom to incite violence.” Almost unanimously, every definition you will find for liberal revolves around an individual’s rights and freedoms — in other words, it’s the opposite of authoritarian. Now I don’t know about you, but it sounds to me like if someone says “don’t say that word,” or “don’t act that way,” or “don’t think that thought,” or if they’re willing to use violence up to and including murder to enforce their beliefs, then that person is not very liberal in any meaningful sense of the word. Sound like anyone you know (or maybe that you’ve seen in the news or on YouTube recently)? I highly suggest reading the Liberalism article on Wikipedia, but here’s the TL;DR: The Democrats (specifically, FDR) stole the word liberal in the 1930s and specifically changed the meaning to big government, i.e., The New Deal. Why on Earth would they want to do such a thing as stealing a word? If you guessed “a list of all slave-owning Democratic and Republican Presidents” — you’re correct. Bonus points if you knew that the names in bold even owned slaves while they were President! Democrats and Republicans never switched sides. 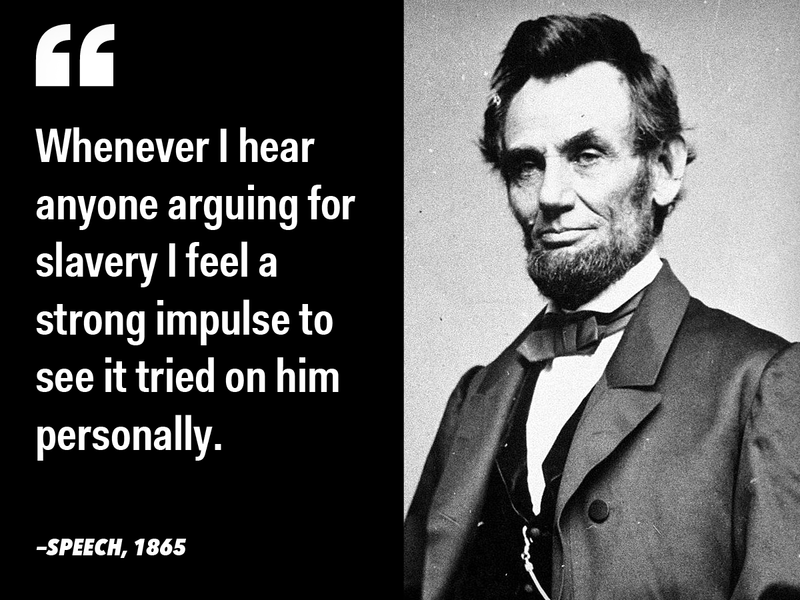 Republicans have been liberal since Lincoln — the Republican who was instrumental in freeing the slaves. Oh, and he was also the first Republican President. I guess that means Republicans have always been liberal. The first Democrat President, on the other hand — Andrew Jackson— signed the Indian Removal Act that led to the Trail of Tears (which, by the way, included many freedmen — e.g., blacks) and threatened to go to war with South Carolina after refusing the remove the tariffs that had been placed on Southern goods by John Quincy Adams. What changed? And why steal a word? Blacks, by and large, never liked the Democrats — for obvious reasons, now that we’ve remembered some of our 6th grade history lessons. But I want to take this to its logical conclusion. Let’s do a little thought experiment: imagine yourself as a recently freed slave after the Civil War. Abraham Lincoln was recently assassinated and the Democrat* Vice President, Andrew Johnson, took office. After 4 years of very little progress towards Reconstruction, a Republican (Ulysses S. Grant) once again wins the vote and takes office in 1869. He immediately backs and passes the 15th Amendment granting you the right to vote. Republicans went to war for you. Republicans said you should have the right to vote, and passed a constitutional amendment to guarantee it. Democrats want you to be a slave. The question: Who do you vote for? And who wins the vote again, and again, and again, and again, and again, and again, and again, and again, and again, and again, and again during the ensuing decades? Yep, count ’em. Republicans won 11 of the 14 elections between Lincoln’s assassination and and FDR. Do you see my point yet? Republicans were liberal, and liberals won. Do you see why the Democrats wanted to steal the word liberal right out of Republican mouths? the Great Depression. Game over. The Great Depression put blacks out of work in droves (over 50%, vs 30% for whites), and then Franklin D. Roosevelt (a Democrat) came to their rescue with a new liberal policy for America — the New Deal! Everyone likes liberal policies, they worked just great before. And everyone loves jobs. It’s a win-win — liberal government and jobs! Blacks were naturally reluctant to support the Democrats, but they needed jobs and FDR was after all in the liberal wing of the Democratic Party — how bad could he be? As we have seen very clearly by now, the Democrats do not give one single damn about a “voter block” once they have been roped in. Pay them lip-service here, pander a bit there without ever actually doing a single thing to support them and they will be as a reliable and docile as a lapdog. The Democrats won over the black voter block in the 1930s by promising liberalism, which they equated with big government and plenty of jobs for everyone. Since then, the party has done nothing to help the black community, and almost every urban area with sky-high black poverty and crime rates is run by Democrats. Liberals of all colors have been roped in, hook, line, and sinker for nearly a century. Not me. Not anymore. The Democratic Party is as anti-liberal, pro-government, pro-globalization, and, to put it plainly, as anti-human as it has ever been. The Republican Party still supports liberalism: individual freedoms and a constitutionally limited government. I don’t know what else needs to be said. This stuff is not tin-foil hat conspiracy theories, this is mainstream history — as mainstream as it gets. Wake up, folks! The Democrats are not going to save you — they never cared about you before, and they don’t care about you now! If you are a liberal, and if you want a liberal in the White House, the choice is clear — Trump 2016. P.S. The Republicans aren’t going to save you either, but at least they will give you the opportunity and economic climate you need to save yourselves. * Lincoln and Johnson were both in the National Union Party during the election. Johnson re-joined the Democrats after he assumed the Presidency.